We hear it all the time: Once you drive a Marathon, you’ll find nothing else compares. Come in, take a test drive. You’ll find it’s easier to handle and the ride is smoother than you’ve ever imagined. Prefer to skip the driving and hire a driver? We can assist you with that, too. Our vehicles’ directional stability, handling and quiet, ultra-smooth ride rival the feel of the world’s leading luxury automobiles. The Volvo engine’s quick response with a fully automatic transmission lets drivers maneuver with precision on winding roads, and negotiate tight spots with ease. “Everyone told me, whatever you do, don’t drive a Marathon, because once you drive one of these, you’re doomed; you’re going to get one no matter what,” said Deborah Finney, a Marathon coach owner since 1993. “One of my favorite features of our coaches is their drivability,” Dave said. “They drive better than anything else out there. We have a lot of customers who trade in fiberglass coaches after driving one of ours. Before the test drive, they didn’t know this kind of ride existed in a motorhome. It’s just very, very smooth, as if you’re in a Lincoln or a Cadillac. One of the things I like about the chassis and the drivability is that the airbags for the air suspension compensate as you turn corners.” For generations, professional drivers have celebrated Prevost coaches for their unmatched drivability, precise and secure dynamic qualities, and superior ride characteristics. Prevost is, quite simply, the coach preferred by those who drive for a living. Employing a sophisticated “multiplexed” architecture, the Prevost driver’s environment provides the kind of long-distance comfort and fatigue-free operation that makes an all-day journey a pleasure. “Marathons has driver-side, passenger-side and rear-facing cameras, which provide many benefits to the driver, such as additional visibility and back-up safety assistance,” said Marathon Coach Sales Consultant Mal Williams. 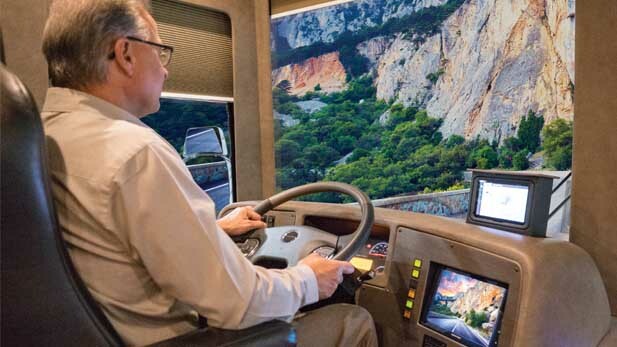 “There’s great visibility, not just because of the cameras, but also due to the precisely placed mirrors and oversized windows.” Prevost places frequently used controls such as cruise control, shifting, engine braking, horn actuation and electric sun visor adjustment on the steering wheel for easier driver access. A pneumatic steering column and ergonomically angled steering wheel ensure that all gauges and indicators are easily readable regardless of driver and steering-wheel position. The result is a driver’s environment designed to optimize intuitive operation, safety and comfort. “Everyone told me, whatever you do, don’t drive a Marathon, because once you drive one of these, you’re doomed; you’re going to get one no matter what,” said Deborah Finney, a Marathon coach owner since 1993. Prevost’s independent suspension includes precisely sized and tuned stabilizer bars on not only the front, but also the drive-axles. This design, engineered to complement the ZF Servocom® power steering, provides exceptional directional stability, confidence-inspiring road feel and best-in-class handling precision.